In an effort to lessen adolescent prescription drug abuse and misuse in Oregon, The Rite Aid Foundation — a nonprofit organization that supports communities where Rite Aid pharmacies primarily operate their businesses — launched a Prescription Drug Safety Program for high schools in Washington, Multnomah and Clackamas counties Friday, April 5. Though the opioid epidemic is nothing new in Oregon, these three counties account for almost half of the state's drug-related deaths, according to 2017 statistics from the Opioid & Health Indicators Database. Washington County had 43 reported drug-related deaths, Multnomah County had 155 and Clackamas County reported 33. According to an Oregon state audit completed in December 2018 by Secretary of State Dennis Richardson, Oregon ranks sixth for teen opioid drug use. "This misuse or abuse of prescription drugs can lead to abuse of illicit drugs such as heroin and fentanyl," the foundation warned. Tracy Henderson, director of The Rite Aid Foundation, said the program is part of a portfolio of things the foundation is doing to address the opioid epidemic and prescription drug abuse. The foundation also has a safe medication disposal program where medication boxes are placed in law enforcement agencies so community members can properly dispose of the drugs. 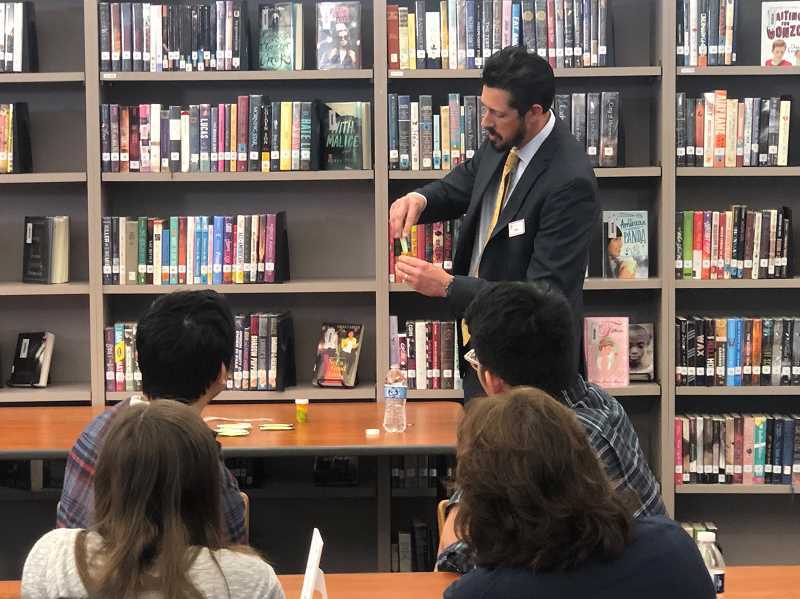 The free prescription drug safety program, which addresses various scenarios teens might encounter when confronted with prescription drugs, was implemented at Centennial High School in Gresham earlier this year as part of a three-year sponsorship with EVERFI — a nationwide educational technology company. The sponsorship also funds the program in five other states: Washington, California, Pennsylvania, Ohio and Michigan, and is expected to reach more than 400 high schools. The 45-minute prevention program provides students with a pre- and post-test, refusal skills, interactive videos and quizzes. The program is usually provided to sophomores in health class, though schools can decide how they want to administer the curriculum and to what grade-level. Jesse Fonseca, a freshman at Gresham's Centennial High School, recently completed the program and said one of the interactive scenarios took place at a party where someone was offered prescription drugs. He saw how the scenario played out based on different decisions, he said. "The program was informative and gave a better sense than a teacher telling you all this and giving you a quiz and test on it. As a student, I had more of a say and could be more engaged with the program," Fonseca said. "At the high school-level is when you would see the highest level of prescription drug abuse (but) in more recent times it does seem like this issue is coming up in younger ages." Fonseca said the program could be approachable for middle schoolers. He said children are no strangers to prescription medication and that it would be helpful to have knowledge about the dangers of abusing prescription drugs at a younger age. Currently, there are no plans to release this program to middle schools. Depending on results and feedback that the foundation receives at the end of the three-year period, there is potential to expand the program to more counties in Oregon and to more states. "We are just trying to learn and see the impact this course can have," Henderson said. "We are receiving great feedback from the students who have taken the course and the schools who have administered the course." Henderson said she believes education is key to combating the issue, and the foundation wants to play a vital role in being part of the solution. "Our core value is being a caring neighbor. Being a distributor of drugs, we take it as a responsibility that we want to be a part of the solution; part of the prevention," Henderson said. "We want to get the word out. We want as many schools as possible to take advantage of this no-cost program that can help them educate their students. ... We would hope the program would provide the tools for young people that they need to make better decisions."